The Massachusetts Food Trust Program (MFTP) provides loans, grants, and business assistance for increasing access to healthy, affordable food in low-income, underserved areas. Started with seed funding from the Baker-Polito Administration in 2018 and in partnership with the Massachusetts Department of Agricultural Resources (MDAR), the MFTP is committed to improving food security and access throughout the Commonwealth. Applications will begin to be reviewed starting October 30th, 2018. This website includes information on how to apply for funding, eligibility requirements, and important information. The mission of the MFTP is to increase access to healthy, affordable food in low-income urban, suburban, and rural communities with an emphasis on businesses producing, promoting, and selling healthy food grown, caught, or harvested in Massachusetts. The MFTP offers critical financing tools and business resources to launch and expand businesses, create jobs, increase economic opportunities, and stimulate the local economy. To help accomplish this, we are looking for a range of projects that will serve underserved communities throughout the different regions of Massachusetts. In addition, we care about ensuring diversity in the demographics of people funded and served. Please review the eligibility requirements for a more in-depth look at the types of projects we are looking for. There are too few grocery stores and healthy food options in many communities throughout the Commonwealth. The situation is pressing: residents in these communities suffer from disproportionately high rates of obesity, diabetes and other diet-related diseases. Communities without local grocery stores also lack the economic revitalization and quality jobs that these stores and other food enterprises can provide. 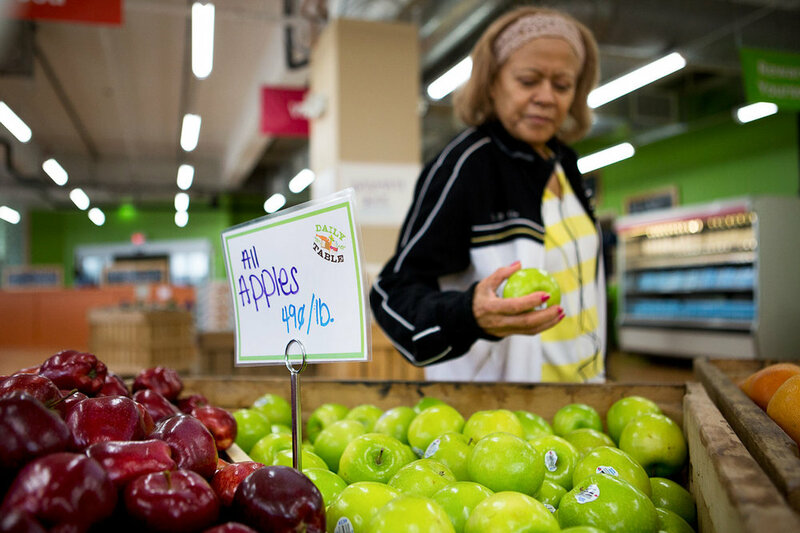 Data collected by The Food Trust shows that 2.8 million people living in low income areas in Massachusetts lack access to grocery stores, including more than 700,000 children and 523,000 seniors. Grocery stores included chain and independent markets with annual food sales of $2 million or more. Low income areas were based on incomes lower than the state wide per capita income level of $36,895. In the map above , the red areas show low-income areas across the state with limited access to grocery stores. Not only are there a lower volume of stores in these areas, but residents are less able to afford travel to the areas that do have stores. These highlighted areas across the Commonwealth are the main targets for MFTP—healthy food projects in these areas will have the greatest impact on Massachusetts residents, but are often difficult to capitalize without innovative, flexible financing solutions.